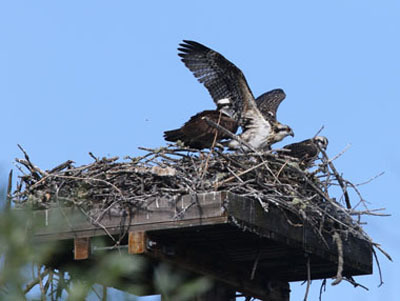 Look closely to see the juveniles in front of the adult. Photo taken 5/25/15. Weight: Males 2 lbs 10 oz. to 3 lbs 8.5 oz. ; Female 2 lbs 12 oz. to 4 lbs 3.75 oz. One morning in July of 2014 after having breakfast in Kelseyville my wife and I decided to take a drive through the state park and see what we could see. As we approached the footbridge crossing Kelsey Slough near the swim beach we spotted this adult Great Blue Heron hunting the Water Primrose in the channel. I photographd the heron as he made his initial and successful strike at this large bullfrog. 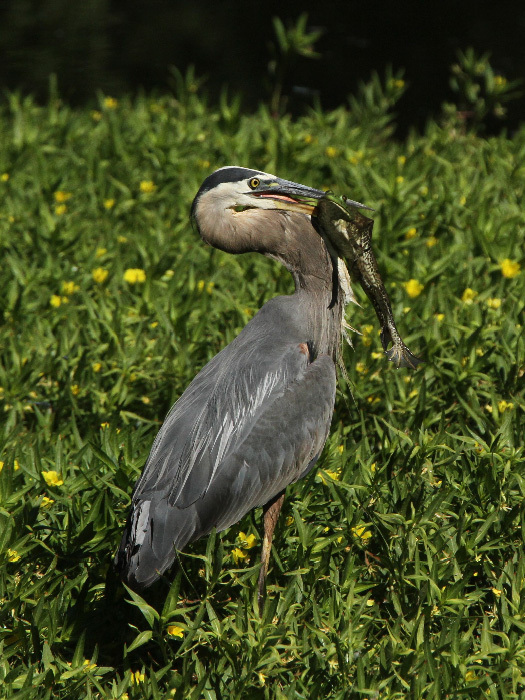 For the next 13 minutes we watched while the heron tenderized the frog and maneuvered the frog for his headfirst trip down the heron’s throat. I took over 300 photos of the event and followed the heron as he flew up and down the channel with the frog dangling from his beak. During the entire ordeal the Bull Frog never struggled. Neither my wife nor I had ever watched a Great Bull Heron take a Bull Frog of this size.